Al Wehda Mecca (SBL) agreed terms with 31-year old Algerian international center Touhami Ghezzoul (209-87, college: N.Dakota St. JC). 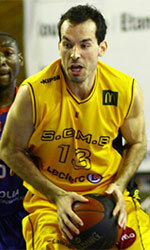 He has played for the last seven seasons at GS Petroliers in Algerian D1 league. Ghezzoul helped them to win the league title. He also played at the Arab Club Championships Semifinals two years ago. Ghezzoul has played also professionally in Oman (An Nasr). He attended North Dakota State College of Science until 2007 and it will be his twelfth (!!!) season as a professional player.